Adenosine is an endogenous nucleoside that acts via G-protein coupled receptors. In vertebrates, arterial or venous adenosine injection causes a rapid and large bradycardia through atrioventricular node block, a response mediated by adenosine receptors that inhibit adenylate cyclase and decrease cyclic AMP concentration. Chronic developmental hypoxia has been shown to alter cardioregulatory mechanisms in reptile embryos, but adenosine’s role in mediating these responses is not known. We incubated snapping turtle embryos under chronic normoxic (N21; 21 % O2) or chronic hypoxic conditions (H10; 10 % O2) beginning at 20 % of embryonic incubation. H10 embryos at 90 % of incubation were hypotensive relative to N21 embryos in both normoxic and hypoxic conditions. Hypoxia caused a hypotensive bradycardia in both N21 and H10 embryos during the initial 30 min of exposure; however, f H and P m both trended towards increasing during the subsequent 30 min, and H10 embryos were tachycardic relative to N21 embryos in hypoxia. Following serial ≥1 h exposure to normoxic and hypoxic conditions, a single injection of adenosine (1 mg kg−1) was given. N21 and H10 embryos responded to adenosine injection with a rapid and large hypotensive bradycardia in both normoxia and hypoxia. Gene expression for adenosine receptors were quantified in cardiac tissue, and Adora1 mRNA was the predominant receptor subtype with transcript levels 30–82-fold higher than Adora2A or Adora2B. At 70 % of incubation, H10 embryos had lower Adora1 and Adora2B expression compared to N21 embryos. Expression of Adora1 and Adora2B decreased in N21 embryos during development and did not differ from H10 embryos at 90 % of incubation. Similar to previous results in normoxia, H10 embryos in hypoxia were chronically tachycardic compared to N21 embryos before and after complete cholinergic and adrenergic blockade. Chronic hypoxia altered the development of normal cholinergic and adrenergic tone, as well as adenosine receptor mRNA levels. 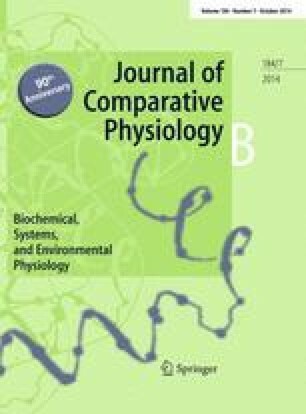 This study demonstrates that adenosine may be a major regulator of heart rate in developing snapping turtle embryos, and that chronic hypoxic incubation alters the response to hypoxic exposure. The online version of this article (doi: 10.1007/s00360-014-0848-6) contains supplementary material, which is available to authorized users. The authors sincerely thank the State of Minnesota Department of Natural Resources for special permit No. 18337 to collect turtle eggs. Thanks to Kevin Tate and Kathryn Gruchalla for assistance. This work was supported by NSF CAREER award IBN IOS-0845741 to DAC and NSF award IBN IOS-0923300 to TR. No conflicts of interests, financial or otherwise, are declared by the authors.